Environmental, social and governance (ESG) topics have never been more prominent in investors’ minds than they are today. But there’s considerable variation among investment managers about how ESG is considered or integrated. Fresh from a series of ESG conferences in the United States attracting investors, managers and scientists, Julie Moret, Head of ESG at Franklin Templeton, outlines five topics that sparked her attention and that investors with an interest in ESG should have on their agenda. ESG is now part of the investment mainstream. No longer a niche consideration, ESG represents a structural shift in the industry that is here to stay. It continues to generate growing levels of interest and awareness, as attendance figures for two high-profile ESG conferences in the United States at the end of last year show. Both the Responsible Investor (RI) Americas Conference (in its 10th year) and the Sustainability Accounting Standards Board (SASB) Symposium drew record crowds (including us) to their events in December 2018. More important than the growing number of attendees at these events, in our view, is the growing number of mainstream asset managers present. We think that reflects just how seriously the industry is taking this issue. However, there remains plenty of variation about what exactly ESG investing entails. As we survey the global investment landscape, we’ve identified five ESG themes we think could drive activity and decision-making in 2019. Our experience, including feedback from events such as the RI Americas Conference and the SASB Symposium, indicates clients are increasingly looking for an integrated approach to ESG from investment managers. This is also supported by findings from the US and European arms of The Forum for Sustainable and Responsible Investment, USSIF and EUROSIF. Still, across the investment management landscape, there continues to be a wide variation in the depth and breadth of ESG integration processes. We think ESG plays an important role from an active management perspective, giving a sense of how companies are managing what are often longer-term strategic risks that can reshape competitive advantage and, ultimately, long-term value creation for shareholders. 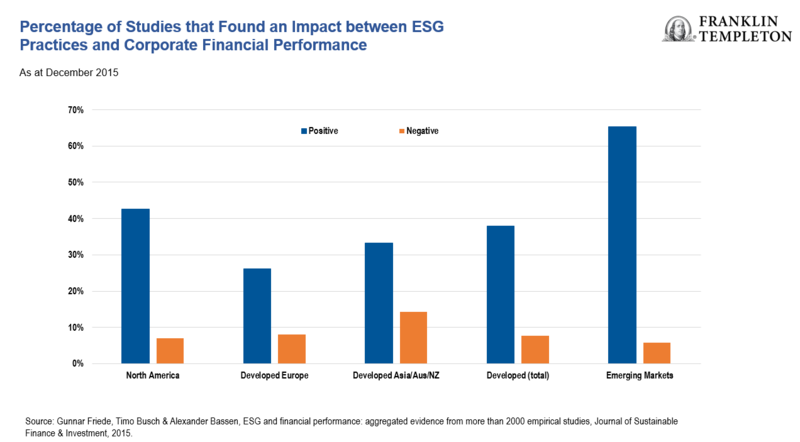 Aggregated evidence compiled in 2015 from more than 2,000 empirical studies found a link between ESG practises and corporate financial performance, with the majority reporting positive findings. We view the integration of ESG factors alongside financial analysis as a form of risk-based investing, grounded in economics that looks to assess both opportunities and risks. The combination of the two deepens our fundamental research and provides an additional tool to differentiate between companies, in our view. Our investment groups have long captured material ESG considerations. The introduction of alternative data sets and tools enables us to deepen our assessment on these issues, enrich our dialogue with investee companies and identify ESG disclosure gaps. In certain instances, ESG themes may be amplified to create an ESG-tilted product to support growing client interest in dedicated sustainability products. Over the years that I’ve been analysing ESG, I’ve noticed a shift in emphasis among investment managers when it comes to climate issues. Early discussions were dominated by carbon footprinting. That was in large part sparked by the introduction of the French Energy Transition Law in 2015, which mandated reporting the carbon footprint of portfolios and how investors were supporting the transition to a low carbon economy. More recently, a more nuanced understanding of climate risks has emerged. Investors’ attention has shifted to the investment opportunities arising from climate transition. In our view, this is a positive development. Speakers at both the RI Americas Conference and SASB Symposium agreed that capital markets had not yet priced in the transition to a lower-carbon economy. In particular, delegates felt the lack of scalable large-scale energy storage could prove to be a challenge, as well as the need to transform existing energy grids to support the transition. Many of the great challenges the world faces fall under the ESG banner, including inequality, climate change, empowering women and population growth. Deploying capital in these areas is not always straightforward but we believe harnessing frameworks like the United Nations Sustainable Development Goals (SDG) and creating innovative investment solutions such as impact investment can support new investment opportunities. In the past there has been scepticism about the role of large asset management firms in the area of impact investing—in other words, investing with the explicit intention of generating financial returns alongside a measurable and positive social and environmental impact. Traditionally, investments in this impact space have been predominantly in private equity vehicles which offer advantages in terms of size and structure. But discussions at the RI Americas Conference and the SASB Symposium suggest that attitude might be changing. Both new and old players, speaking in panel sessions at the events, felt there was generally no direct competition for the same deals between public and private equity investors. Furthermore, the involvement of public equity investors in this space could potentially create exit opportunities for smaller players and address liquidity issues. Speakers at the two conferences also called for more exploration around how listed equity and fixed income investments could be used to add scale to impact investing. Our view is that to achieve true impact, investors must recognize the complexity of the environmental and societal issues and create solutions that are authentic and credible to avoid accusations of “green washing” or creating an impact “bubble”. A growing theme in ESG circles is the impact of so-called “convenience culture” pollution. The world’s oceans contain 150 million tonnes of plastic, with 8 million being added annually.3 At this rate it is projected that by 2050 there will be more plastic by weight than fish in our oceans. Meanwhile, we have begun to see a shift in consumer behaviour and regulatory pressure on curbing single-use plastics. With only 9% of plastics globally recycled, this is an area governments are keen to address. The European Union (EU) has set targets that by 2025 90% of plastic is to be recycled. This shift will require companies to think about circular economy solutions. The economics of plastic use is also changing. The manufacture of plastics is extremely energy-intensive. Oil and gas comprise two-thirds of input costs when producing plastics, so effective carbon pricing could dramatically increase cost pressures. We have seen some divergence between regulators in Europe and the United States on ESG topics. 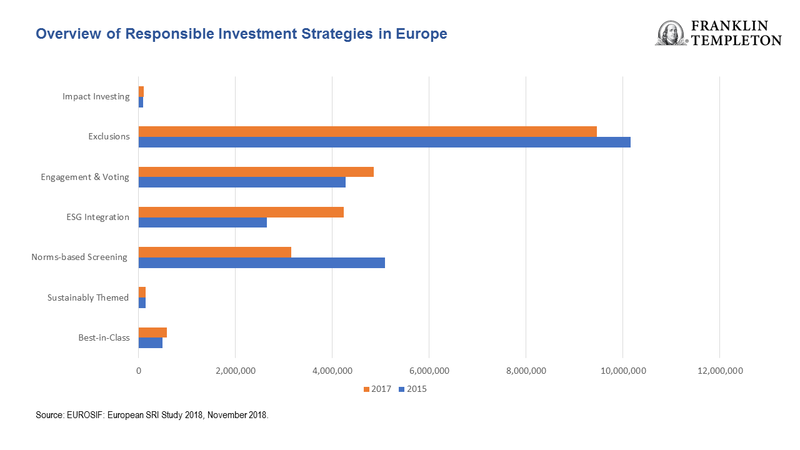 While Europe is aiming to hardwire sustainability into its capital markets, there has been a growing corporate voice of dissent in the United States against investor influence on sustainability factors like climate change. Investors are paying particular attention to the Securities & Exchange Commission (SEC) and developments around shareholder resolutions and proxy voting advisors. It seems clear to us from the discussions that took place during the RI Americas Conference and the SASB Symposium that despite increased lobbying from corporates, investors will continue to put pressure on companies to address material ESG factors and exercise their rights to file proposals on behalf of clients where necessary. We believe active managers have a role to play in encouraging corporate disclosure of decision-useful ESG information which will further the industry’s development of ESG practice. SASB’s materiality frameworks provide a useful tool which we believe helps further constructive corporate engagement. Our investment process continues to evolve to reflect the integration of our ESG analysis. That, in turn, informs our engagement with companies as active stewards of our clients’ money. Data from third-party sources may have been used in the preparation of this material and Franklin Templeton Investments (“FTI”) has not independently verified, validated or audited such data. FTI accepts no liability whatsoever for any loss arising from use of this information and reliance upon the comments, opinions and analyses in the material is at the sole discretion of the user. Products, services and information may not be available in all jurisdictions and are offered by FTI affiliates and/or their distributors as local laws and regulations permit. Please consult your own professional adviser for further information on availability of products and services in your jurisdiction. For timely investing tidbits, follow us on Twitter @FTI_Global and on LinkedIn. All investments involve risks, including potential loss of principal. The value of investments can go down as well as up, and investors may not get back the full amount invested. Stock prices fluctuate, sometimes rapidly and dramatically, due to factors affecting individual companies, particular industries or sectors, or general market conditions. 1. Source: USSIF: US Sustainable, Responsible and Impact Investing Trends, October, 2018. 2. Source: EUROSIF: European SRI Study 2018, November 2018. 3. Source: World Economic Forum. The New Plastics Economy: Rethinking the future of plastics, January 2016.